My bedroom desperately needed some help before I entertain guest speakers in two weeks. 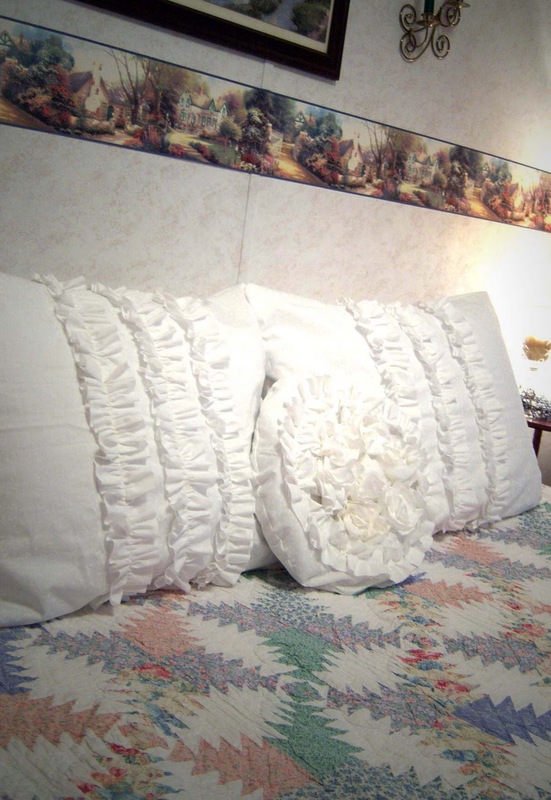 You see the comforter on the bed was not only faded, but also had a hole torn in the center of it with no possible way for an inconspicuous "patch up." 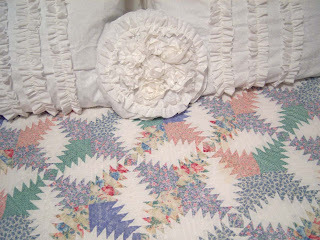 That problem was solved with a thrift store find --- a beautiful quilt - with lots of wear left in it for only $12!!!!! There's absolutely no way I could beat that price and still make a quilt to my liking - so of course I bought it. Problem #2 - The quilt didn't come with any pillow shams! I went on-line and looked "high and low" for some that I liked (and would half way match) but couldn't find anything that suited me for under $34 a piece! 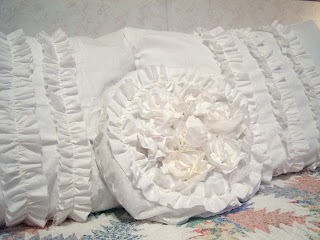 THEN I came upon this ruffled pillow tutorial from JCD and fell in love! Not only did I already have the material on hand, but I also had a free afternoon (after school) to "whip" them up! 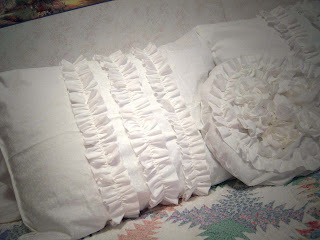 So happy with how they turned out --- I even made a little round throw pillow to match! 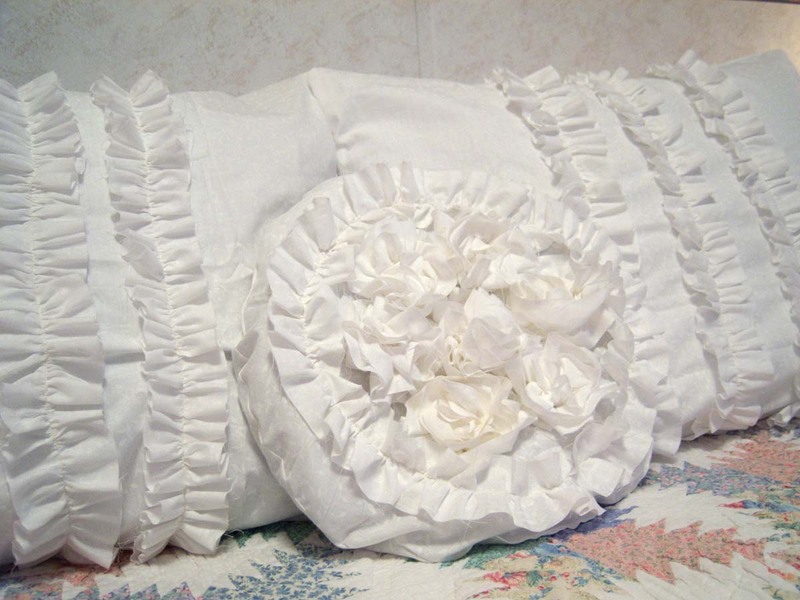 The big "roses" in the center were made by winding up the ruffles and hand sewing them on. Now I won't have to be embarrassed to put guests up in my room come November! Here's a little better view of the quilt --- especially for my mom -- since she wanted to see what it looked like! You got a fabulous deal on that quilt! I love the shams that you made, too. They are sooo pretty! Isn't it amazing to think of all the work that's gone into that quilt and to buy it so cheaply! The pillows look great with it too. A perfect solution! 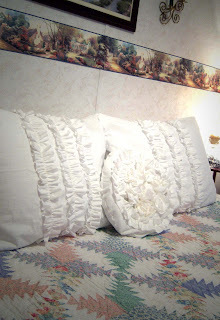 I don't like shams that match anyway so I LOVE your ruffled pillows with your quilt. And what a find with that quilt! Have fun entertaining your guests. Thanks for the compliment on my rag pillow...love your blog and all your crafty ideas. 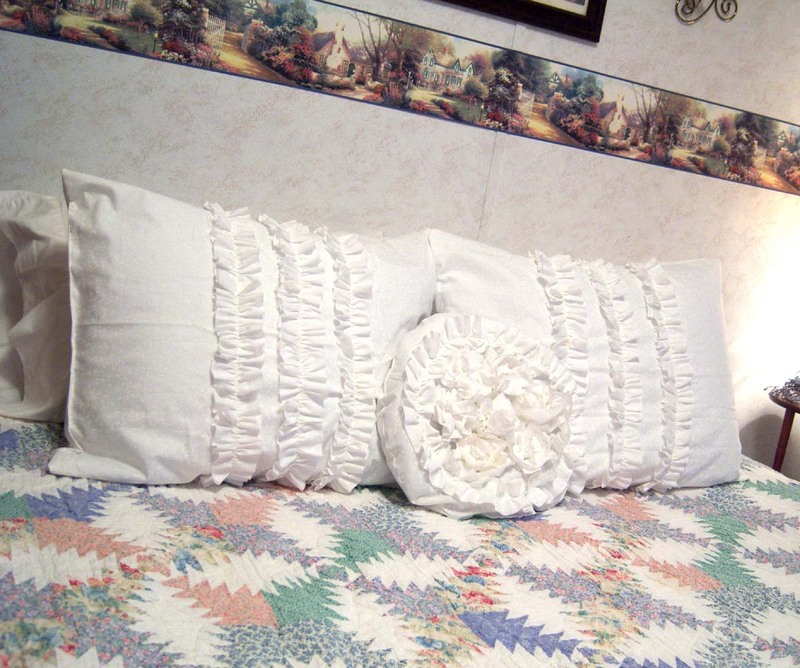 How on earth did you make the big rosey thing on the pillow? must have one of these..giggle giggle!! Fabulous!! Super charming!! Thank you for sharing at Feathered Nest Friday! They turned out lovely! 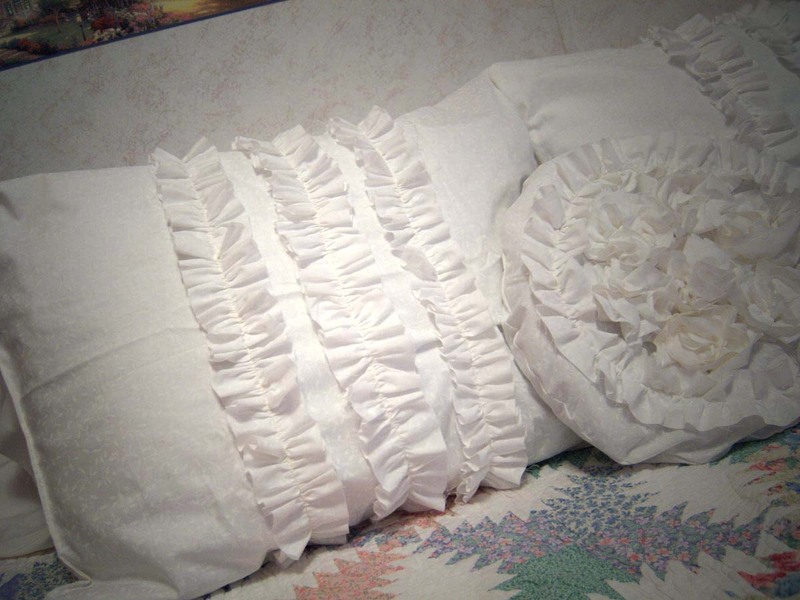 I have always wanted to make some white ruffled pillows, but just haven't got around to it yet.